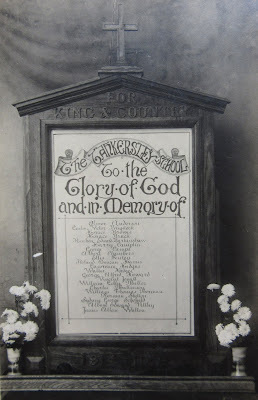 Theses names are transcribed from a photographic postcard of the Tankersley School Memorial. The memorial's location is currently unknown. The postcard is shared with kind permission of the owner. and has been transcribed by members of the BWMP. The Tankersley School, To the, Glory of God, and in memory. Hoyland Methodist Church WW2 Memorial, (formerly) Market Street, Hoyland. Hoyland WW2 Methodist Church memorial. This WW2 memorial was originally displayed in the Methodist Church on Market Street at Hoyland. The memorial is now part of a private collection and is shared here with kind permission of the owner. The memorial has been photographed and transcribed by members of the BWMP. To the Glory of God and the Abiding Memory of the Young Men of this Church and Sunday School who fell in the Second World War 1939-1945. "Greater love hath no man than this, that a man lay down his life for his friends"
Hoyland Methodist Church WW1 Memorial, (formerly) Market Street, Hoyland. 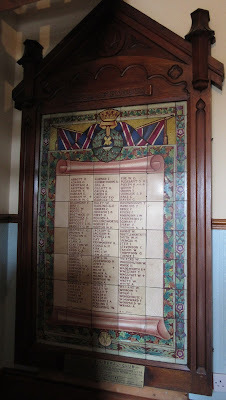 This WW1 memorial was originally housed in the Market Street, Methodist Church at Hoyland. It is currently in a private collection and has been shared here with kind permission of the owner. To the Glory of God and the Abiding Memory of the Young Men of this Church and Sunday School who fell in the Great War 1914-1918. "And so they passed over, and all the trumpets sounded for them, on the other side." Lodge No. 4194 was established in 1843 and met at the Wortley Arms before transferring to Thurgoland in the 1970s. This memorial is currently part of a private collection and has been shared by kind permission of the owner. Memorial researched and transcribed by members of the BWMP and information provided by the Oddfellows Society. This memorial was originally housed in the Barnsley Radical and Liberal Club on Market Street, but is now part of a private collection. 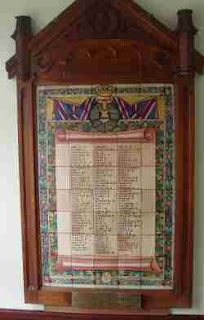 It is a large memorial approximately 7 feet tall consisting of an ornate wooden frame with the words 'Roll of Honour' carved in the wood with decorative inner ceramic tiles that contain a scroll with names of men from the club who served in the Great War. Our original post from March 2014 reporting the existence of this memorial, with map and contemporary newspaper cutting. Photographed, researched and transcribed by members of the Bwmp. 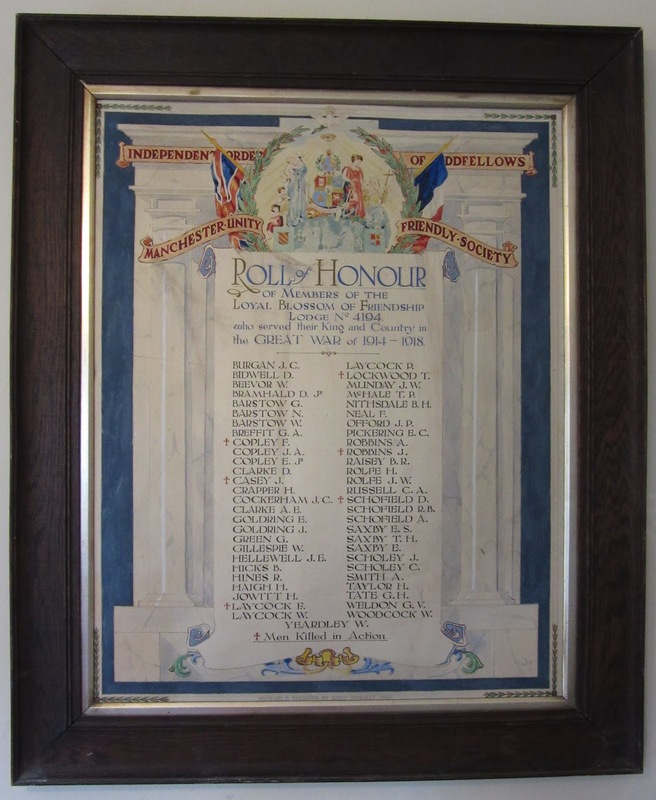 The Barnsley War Memorials Project recently discovered via an online forum, that one of our missing war memorials was sold at auction twelve years ago and purchased by someone in the local area. 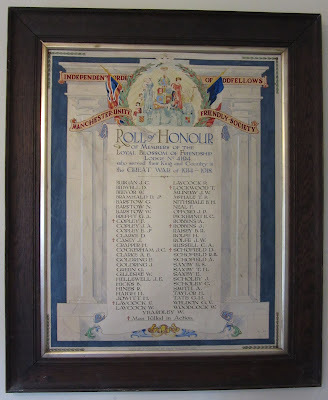 Originally the war memorial was housed within the Barnsley Radical and Liberal Club on Market Street. It is a very large piece, measuring 7 feet in height. It features ceramic tiles in an oak frame and has the names of 127 men who fought, 8 of whom were killed. We know from the forum that a local business man bought it at auction for safe keeping on 10th August 2005, but nothing beyond that. The project are very grateful to this gentleman for saving the memorial and would love to be able to see the memorial and obtain clearer photographs of the inscribed names to aid us in our research for the Roll of Honour, which will be published for the centenary of the end of the war, next year. If you have any information please leave a comment below. Alternatively you can message us privately via our Facebook page.